A (relatively) quiet, light, linear created after Matias was called upon by the Open Steno Project to create a better linear switch. These are my favorite key switches still in production. They have just the perfect feel for gaming, and they're smooth enough that typing feels like you're typing on air. The thunk is also super satisfying but not too loud. The weirdest Switch I have ever tried. Even though it's linear or at least titled as such, the feel could be better described like a mixture of topres and mx-browns. I really like it but the shortened travel distance is a bit annoying. A very specialized switch that is great for gaming and touch typing. 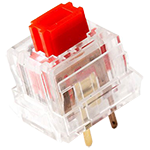 Switches are incredibly smooth and have very little key wobble.Typing on these switches can be very enjoyable if you like VERY light switches. Have experience using Matias Linear switches? Add a review to share your knowledge with the keyboard community.